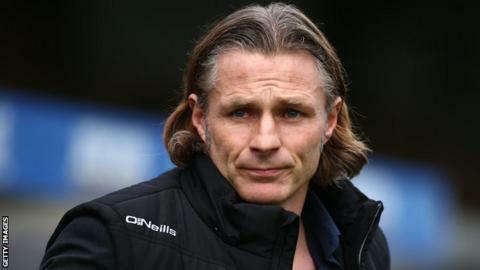 League Two Wycombe Wanderers have rejected a Championship club's approach to speak to boss Gareth Ainsworth. Barnsley are the only side in the second tier without a manager after Paul Heckingbottom left to join Yorkshire rivals Leeds last week. Former QPR midfielder Ainsworth, 44, has been Wycombe boss since initially being made player-manager in 2012. "Gareth is under contract with us and continues to do an outstanding job," said a club statement. "Therefore we are fully focused on continuing the progress we are making with him in charge." Ainsworth, who captained the Chairboys before retiring in 2013, kept them in League Two on the final day of the 2013-14 campaign before leading them to the play-off final the following season. Wycombe are third in League Two in the final automatic promotion place, and unbeaten in seven league games. BBC Sport Wales understands Barnsley have now approached Premier League side Swansea City in order to hold talks with coach Cameron Toshack over their vacant managers role. Toshack, who is the son of Wales legend John Toshack, is currently in joint-charge of the club's under-23 side and last season led them to the Premier League 2 title and also reached the semi-finals of the Premier League International Cup. Toshack also assisted Leon Britton when he took caretaker charge of the senior team following the sacking of Paul Clement in December. Barnsley, who have also identified St Mirren boss Jack Ross as a managerial candidate, are in the Championship relegation zone.